gtagrl had the most liked content! That's brilliant. I recognize a few of them but hadn't put two and two together. Will keep an eye out for sure. iGTA Crew Night - GTA Online next Tue Dec. 11 - see you there! Lots of folks are playing RDO beta, Fallout 76, and others games altogether - but it's been a while since we jet packed around nightclubs! Save the date: Tuesday, December 11, GTAO crew night, for anyone that still has access to the game and wants to join us for a wee bit of shenanigans! ---RIP Tuesday Nights--- SHENANIGANS 4 LYFE --- Weekly crew nights are no more, but there will be occasional times when the iGTA Crew will reunite in to Los Santos. This is an open thread to post photos and make plans! --- Crew Rules for posterity: * Join the iGTA forums to be eligible for an invitation to the Social Club Crew. * Add crew staff on the Playstation Network to get invited to GTAO lobbies. PSN Names are underneath our forum avatars, along with Social Club, Twitter, etc. * Join anytime, the earlier the better. We start in a crew lobby, join via friends list or party chat. If you can't get in, ask for an invite, sometimes we end up in an invite-only after jobs. We round everyone up and send out fresh invites after each playlist. * If there's an "EVENT THEME", please dress appropriately. * NO CREW KILLING, unless #shenanigans happen or agreed upon. You're not in a public lobby, so save it for when you are. * NO DIRTY RACING! A number of our jobs have specific rules, so pay attention, read the description, and listen to the creator's instructions. * NO BULLET-PROOF HELMETS, SNACKS or GOING OFF-RADAR during competitive playlists. For GTA races, use pickups only (rockets, boost), no thrown explosives or drivebys. * Don't ruin photo or video setups. No getting a 4-star wanted level when someone's staging a shot. Just don't. Theme list for posterity: Vehicle-based Altitude | Apocalypse | Brand Expo | BMX | Classic/Vintage | Crotch Rockets | Drift | Forgot-I-Had-This | Hot Rods | Hotring Circuit | Junker | Lowriders | MC | Military | Monster Truck | Motocross | Muscle | Off-Road | Rally | Stunt | Supercars | Truckers | Tuners | Utility | Watercraft Thread-based 80's | Animals: Altitude/Dapper/Dirty/Party/MC | Beach Bums | Bums | Business | Clowns | Cowboys | Crew Blue | Emergency Services | FIB | GTA Characters | Gangs | Hell | Hippy | Imposter | Ninjas | Pimps & Hoes | Pirates | Punk | Rockabilly | Rock & Roll | Safari | Scuba | Steampunk | Toga | Underpants Party | Vinewood | Warriors | Waterworld | Wrestling | Zombies Calendar-based New Year's | Valentine's Day | St. Patrick's Day | Cinco de Mayo | Memorial Day | Freedom | Labor Day | Halloween | Festive Surprise | Olympics Themes. It's what we (used to) do. ---Rule number one. You do not talk about Red Dead.--- TUE OCTOBER 30 - 3PM (PDT) / 6PM (EDT) / 7PM (ADT) / 10PM (GMT) *Clocks fall back Nov 4 in Canada/USA; Daylight Savings ended on Oct 28 in the UK* --- Join us this Tuesday for iGTA Crew Night! #shenanigans, crew-created jobs, photo ops, streaming, etc... Join when you can, stay as long as you like, and please post your pics and videos here for all to enjoy! Crew nights are always more hilarious from multiple viewpoints, so show and tell your side of the story! If you created a new job, post a link here so the playlist DJs can bookmark it, or in the PSN iGTA group chat. 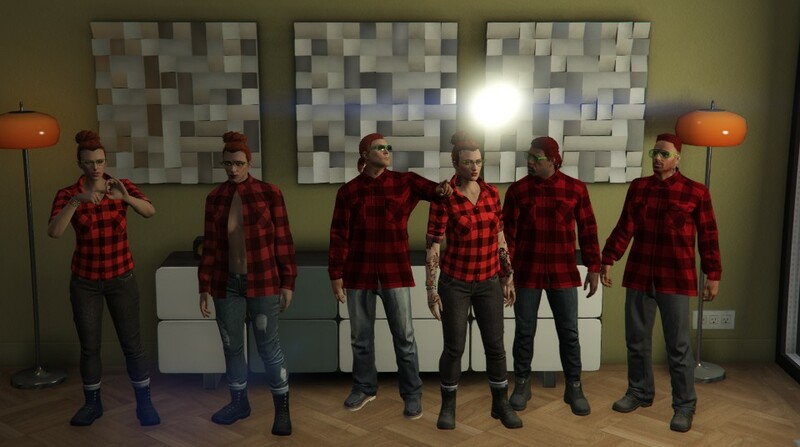 Photos are occasionally featured at @iGrandTheftAuto. Please tag your crew content with #igta! --- Theme: In a supreme feat of delegation, DiO enlisted Nemosphene's budding Photoshop skillz to put together a scaaaary banner for this year's Halloween spook fest! It looks fantastic, thanks a million! (y) If you can tear yourself away from hunting, fishing, and growing out your beard while getting into fist fights at the saloon, hop into GTAO for some Halloween fun! Pick any of the game's many themed items - dress up as evil pumpkins, witches, zombies and assorted monsters, drive up in those hearses, and if you have a vehicle with a skull-covered livery, now's the time to rattle those bones! Thots: A Zombie MC lineup on a row of Sanctuses is something we haven't done before, there are the zombie masks with built-in helmets that could work. If you do decide to show up, do your best to be there at the regular time, we'll gather as many as we can for a playlist before people head back to the bayou or move on. ***ALL RED DEAD TALK IS OFF LIMITS*** Looking ahead... After Halloween, formal weekly crew nights will pause until we meet in another game! Down the road, GTAO crew meets will be no theme (but repping crew blue is always welcome), to explore new DLC, or to have a snowball fight in blinky pajamas. I'll post an open thread topic after this one, for future snaps and chat about upcoming meets. Red Dead Online and Fallout 76 become available in November. Look for crew night topics in the RedDead/Fallout sections of the forums. We have an active Discord channel - join us there if you haven't already, DM for an invite if you need one. --- * Join the iGTA forums to be eligible for an invitation to the Social Club Crew. * Add crew staff on the Playstation Network to get invited to GTAO lobbies. PSN Names are underneath our forum avatars, along with Social Club, Twitter, etc. * Join anytime, the earlier the better. We start in a crew lobby, join via friends list or party chat. If you can't get in, ask for an invite, sometimes we end up in an invite-only after jobs. We round everyone up and send out fresh invites after each playlist. * If there's an "EVENT THEME", please dress appropriately. * NO CREW KILLING, unless #shenanigans happen or agreed upon. You're not in a public lobby, so save it for when you are. * NO DIRTY RACING! A number of our jobs have specific rules, so pay attention, read the description, and listen to the creator's instructions. * NO BULLET-PROOF HELMETS, SNACKS or GOING OFF-RADAR during competitive playlists. For GTA races, use pickups only (rockets, boost), no thrown explosives or drivebys. * Don't ruin photo or video setups. No getting a 4-star wanted level when someone's staging a shot. Just don't. --- Upcoming Events: ---RDR2 released on Fri Oct 26 (everyone has saddle sores)--- ---Fallout 76: PS4 B.E.T.A. dates Oct 30, Nov 1, 3 & 4 / Game releases Fri Nov 14--- (Events Subject to Change depending on crew input or when Rockstar releases new DLC) Themes: Vehicle-based Altitude | Apocalypse | Brand Expo | BMX | Classic/Vintage | Crotch Rockets | Drift | Forgot-I-Had-This | Hot Rods | Hotring Circuit | Junker | Lowriders | MC | Military | Monster Truck | Motocross | Muscle | Off-Road | Rally | Stunt | Supercars | Truckers | Tuners | Utility | Watercraft Thread-based 80's | Animals: Altitude/Dapper/Dirty/Party/MC | Beach Bums | Bums | Business | Clowns | Cowboys | Crew Blue | Emergency Services | FIB | GTA Characters | Gangs | Hell | Hippy | Imposter | Ninjas | Pimps & Hoes | Pirates | Punk | Rockabilly | Rock & Roll | Safari | Scuba | Steampunk | Toga | Underpants Party | Vinewood | Warriors | Waterworld | Wrestling | Zombies Calendar-based New Year's | Valentine's Day | St. Patrick's Day | Cinco de Mayo | Memorial Day | Freedom | Labor Day | Halloween | Festive Surprise | Olympics Themes. It's what we do. ---Howdy, pardner...you're welcome to join us by the fire...--- TUE OCTOBER 23 - 3PM (PDT) / 6PM (EDT) / 7PM (ADT) / 11PM (BST) *Daylight Savings ends on Oct 28 in the UK and on Nov 4 in Canada/USA* --- Join us this Tuesday for iGTA Crew Night! #shenanigans, crew-created jobs, photo ops, streaming, etc... Join when you can, stay as long as you like, and please post your pics and videos here for all to enjoy! Crew nights are always more hilarious from multiple viewpoints, so show and tell your side of the story! If you created a new job, post a link here so the playlist DJs can bookmark it, or in the PSN iGTA group chat. Photos are occasionally featured at @iGrandTheftAuto. Please tag your crew content with #igta! --- Theme: It is LESS than a week before we'll be playing Red Dead Redemption 2! What better way to get the right headspace than by honoring cowboys in GTAO? Let's stick to old-skool cowboy looks this time - no modern bandits - and let's use vintage weapons too! Looking ahead... This marks one of the last regular GTA crew nights. The week after this Cowboys, Halloween Night is an annual classic for anyone looking to take an hour away from Red Dead singleplayer. R* often has special treats for Halloween, we'll see if they provide anything new, or if they just stick to making the on-theme cars and spooky custom items available. ***IF YOU ATTEND HALLOWEEN NIGHT IN GTA, ALL RED DEAD TALK WILL BE OFF LIMITS*** After Halloween, formal weekly crew nights will pause until we meet in another game! Down the road, when we do gather in GTAO, it'll be no theme, to explore new DLC, or to have a snowball fight in blinky pajamas. Congratulations on reaching the FIVE YEAR anniversary of continuous weekly GTA topics - bOnEs posted the first GTAOnline topic on November 11, 2013! 😮 http://www.igta5.com/forums/topic/4410-igta-multiplayer-event-nov-11th-ps3/ Red Dead Online and Fallout 76 become available in November. Look for crew night topics in the RedDead/Fallout sections of the forums. We also have a new Discord channel - join us there, DM for an invite if you need one. --- * Join the iGTA forums to be eligible for an invitation to the Social Club Crew. * Add crew staff on the Playstation Network to get invited to GTAO lobbies. PSN Names are underneath our forum avatars, along with Social Club, Twitter, etc. * Join anytime, the earlier the better. We start in a crew lobby, join via friends list or party chat. If you can't get in, ask for an invite, sometimes we end up in an invite-only after jobs. We round everyone up and send out fresh invites after each playlist. * If there's an "EVENT THEME", please dress appropriately. * NO CREW KILLING, unless #shenanigans happen or agreed upon. You're not in a public lobby, so save it for when you are. * NO DIRTY RACING! A number of our jobs have specific rules, so pay attention, read the description, and listen to the creator's instructions. * NO BULLET-PROOF HELMETS, SNACKS or GOING OFF-RADAR during competitive playlists. For GTA races, use pickups only (rockets, boost), no thrown explosives or drivebys. * Don't ruin photo or video setups. No getting a 4-star wanted level when someone's staging a shot. Just don't. 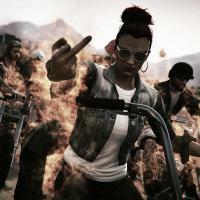 --- Upcoming Events: ---RDR2 releases Fri Oct 26--- October 30 - Halloween ---Fallout 76 releases Fri Nov 14--- (Events Subject to Change depending on crew input or when Rockstar releases new DLC) Themes: Vehicle-based Altitude | Apocalypse | Brand Expo | BMX | Classic/Vintage | Crotch Rockets | Drift | Forgot-I-Had-This | Hot Rods | Hotring Circuit | Junker | Lowriders | MC | Military | Monster Truck | Motocross | Muscle | Off-Road | Rally | Stunt | Supercars | Truckers | Tuners | Utility | Watercraft Thread-based 80's | Animals: Altitude/Dapper/Dirty/Party/MC | Beach Bums | Bums | Business | Clowns | Cowboys | Crew Blue | Emergency Services | FIB | GTA Characters | Gangs | Hell | Hippy | Imposter | Ninjas | Pimps & Hoes | Pirates | Punk | Rockabilly | Rock & Roll | Safari | Scuba | Steampunk | Toga | Underpants Party | Vinewood | Warriors | Waterworld | Wrestling | Zombies Calendar-based New Year's | Valentine's Day | St. Patrick's Day | Cinco de Mayo | Memorial Day | Freedom | Labor Day | Halloween | Festive Surprise | Olympics Themes. It's what we do.